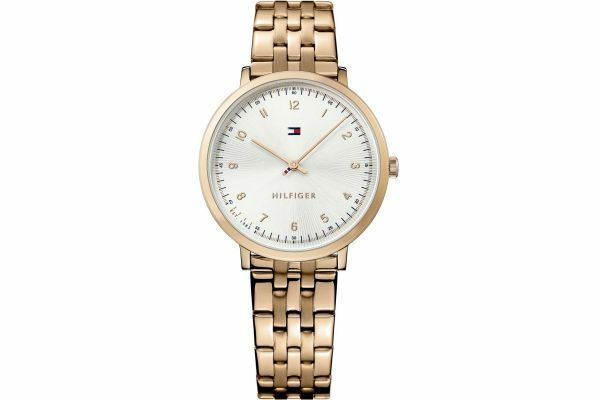 This stunning women’s watch is brought to you by renowned fashion designer Tommy Hilfiger as part of their Pippa collection. Delicate in design, the Pippa features a lightweight polished Rose Gold plated stainless link bracelet further complimented by the 35mm polished slim line round case and bezel. Elegant in its simplicity, the Pippa showcases a silver dial accentuated by petite gold numbers and graceful rose gold batons. Powered by Quartz movement and protected by mineral glass this watch is water resistant up to 30 metres. Complete with a 2 year guarantee. This classic yet dainty watch is ideal for both casual and formal attire; a statement watch for all occasions. For us to size your new Tommy Hilfiger Ultra Slim watch as accurately as possible, please take a look at our downloadable Watch Sizing Guide.